The Mighty Investor trifecta is to earn money, save as much as possible, and invest wisely. Each of these three factors is crucial to achieving financial independence. Without Earnings, you are dead in the water. Without Savings, you never develop the seed capital to start building assets. And without quality Investments, you can never shift from active to passive income. Personal Capital is what I call a "robo-advisor plus" service. By this, I mean that for a fee of less than one percent of assets managed, the company provides you access to an investment advisor and then uses software to manage your portfolio. 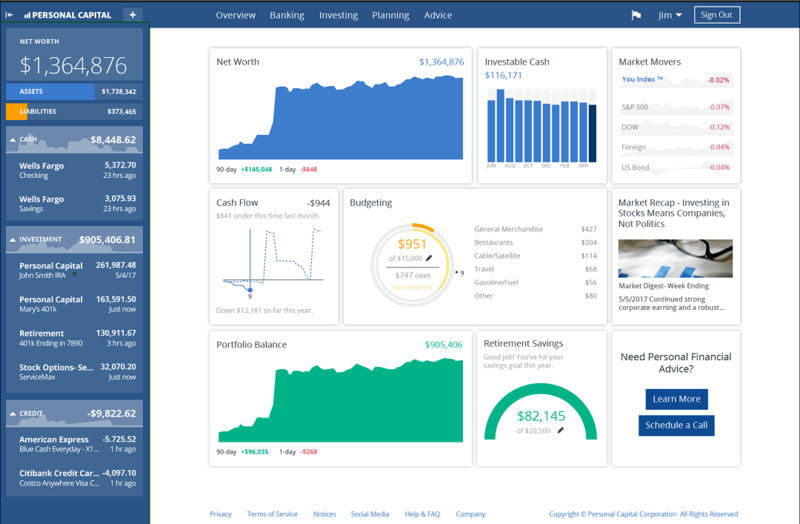 I have not used Personal Capital's paid service because I prefer to manage my own investments, but I do use the free portfolio analysis tools. That is what this review covers--the free portion of Personal Capital. Signing up for Personal Capital is quite simple. I'm not going to waste your time walking you through a bunch of screenshots on how to set up an account online. It's simple, and it's free. Once you have your account set up, you link your investment, savings, and credit card accounts to the company's website so that you have a complete snapshot of your finances. In my opinion, there is one reason, and one reason only to sign up for the free Personal Capital service. The software the firm has built that analyses your portfolio is powerful. The best way to illustrate this is with a few screenshots. This first screenshot shows the performance of a hypothetical portfolio for the first five months of the year. You can see immediately how your portfolio is performing relative to key benchmarks (in the below screen the performance is relative to the S&P 500. Do you see how this visual representation can quickly show you the relative proportions of all the asset classes you own? It's powerful, and the visual element helps you understand what is happening on a deep level. 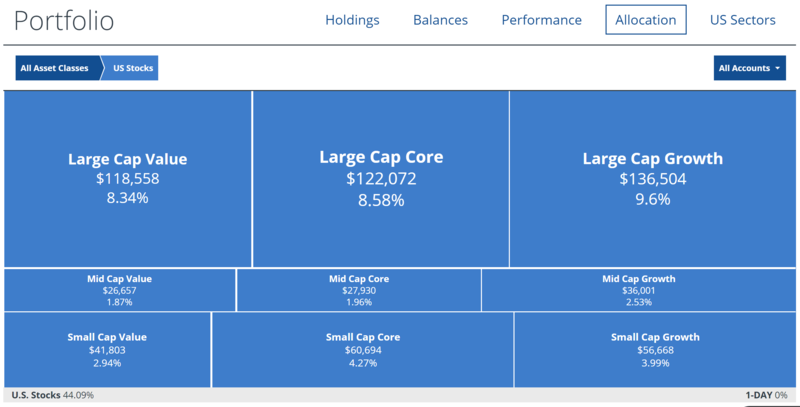 Next, you can click on any of the broad asset classes to get a more detailed breakdown. For example, if I click on the U.S. stocks rectangle in the above image, here is what comes up. Do you see how powerful this information can be? When I first signed up for Personal Capital and started analyzing my portfolio, I noticed a portion that was "cash." I drilled in and discovered that in one of my investment accounts I had a small (but not insignificant) amount of cash that I had somehow overlooked. It wasn't invested and needed to be. I quickly addressed this issue. I also discovered that I was tilted more heavily towards large-cap stocks than I realized. This type of analysis is gold. Indeed, if you have accounts with Vanguard and use their Portfolio Watch service, I urge you to also sign up for Personal Capital's free service. The visual mapping of your assets is extraordinary and helped me understand what was going on with my Vanguard assets on a more profound level. In addition to the portfolio performance and asset allocation analysis that I've just explained above, there is a third feature that I really love with Personal Capital. 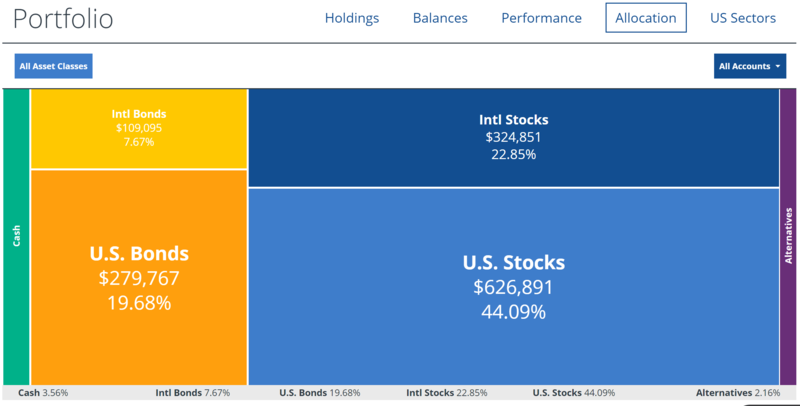 Under the portfolio performance tab, you can quickly see the total income thrown off by your portfolio. This is extremely handy for those readers who are working towards financial independence and plan to live off the income thrown off by their portfolio. This income feature provides a 30,000-foot snapshot of the income from all your holdings in one place. It saves you from having to do a lot of simple math by hand. There is only one major downside that I am aware of when it comes to Personal Capital. The way the company actually makes money is as a "Robo Advisor plus." This means that for a very small fee (well less than 1 percent of assets managed), you get access to a financial planner and Personal Capital's propriety software would actually manage your money for you--making the decisions as to which index funds you should own, at what allocations, etc. This is great and may be an appropriate service for some. But the downside of Personal Capital is simply this. Once you sign up, for the first few weeks, the company may call or email you quite often in an attempt to get you to sign up for their paid "robo plus" service where they manage your assets for you using their proprietary software. It probably isn't too much to say they "bombard" you for those first few weeks. I personally did not find this terribly annoying. I never actually answered the phone when they called, and I responded to their emails saying, "Please do not contact me again about this. If I decide to use your paid service, I will reach out." This seemed to diminish the emails, but not the phone calls. Eventually, all such communications petered out after a few weeks. To be honest, I get it. Personal Capital is in business to make money. The company needs to convert a certain number of those accounts that have signed up for the free portfolio analysis software to paying clients. I don't blame them for making a bit of a hard push to close the sale, and--indeed--the calls and emails did stop in a matter of weeks. I just wanted you to be aware of what may be coming your way. If you use Mint.com to track your finances, I definitely recommend you still sign up for Personal Capital for a couple of reasons. First, the investment analysis portion of Personal Capital is much more robust than Mint. Mint works great for tracking spending. (Indeed, Mint probably works better for tracking credit card purchases and analyzing how you spend.) However, Personal Capital's investment analysis blows Mint out of the water. In addition, with all of these sites that track your finances for free, sometimes they stop downloading the data from one or more of your investment accounts due to technical glitches. By having both Mint and Personal Capital running, if you see a discrepancy develop between the total balances tracked in the two services, you will more easily figure out there is a problem with the data being downloaded with one of them. Personal Capital uses two-factor identification every time you log in to their site, and the fact that Personal Capital was founded by Bill Harris, the former CEO of Intuit (maker of TurboTax) and PayPal, also gives me peace of mind. To sum up, Personal Capital significantly deepens your perspective on your investments. The features I've highlighted in this post emphasize just the tip of the iceberg when it comes to the tools the software provides in analyzing your investment portfolio. Given that the software is free, I suggest you sign up now.